I have a friend whose mantra is “Ease, Flow, Fun.” He signs his emails with this thought. He brings it to all his encounters, no matter how serious. This friend also happens to have a delightful relationship to Trickster energy. It is not uncommon for him to simply burst out laughing for no apparent reason. I suspect some goofy, invisible being has just told him a joke. I believe this invocation (or one like it) could come in handy over the next three weeks as we learn not to sweat the small stuff. “Ease, flow, fun” is a good strategy for staying present to fluctuating and unpredictable energies. It is a good strategy for simply bringing more joy into our lives. I encourage you to try it at home yourself this week. Here’s the reason: We’re moving from a lunar cycle where the prime directive was to anchor our beginnings with the fixed earth energy of Taurus into a mutable season of flow and adaptation. In the lunar cycle that began on May 17 along the edge between Taurus and Gemini,* the opportunity is to remain anchored but flexible. Gemini (mutable air) is the predominant energy of this lunar cycle even though it began in Taurus. This week, the Sun enters Gemini, joining Mars and Mercury, which amplifies the uncertainty quotient by turning retrograde on May 18. Most of the week Pluto in Capricorn (cardinal earth) exerts a pull from deep underground. The aspects are not exact but there is a yod aspect pattern in effect for most of the week ahead. This pattern is comprised of Jupiter in Leo (fixed fire) quincunx Pluto, stationary Mercury in Gemini (mutable air) quincunx Pluto, and Mercury and Jupiter sextile each other. A yod can be stressful. We are trying to accommodate things that don’t play well with each other. Some of these things involve secrets, behind-the-scenes manipulations, and toxic systems of power. This proclivity for darkness meets goofiness (Mercury) and nobility (Jupiter)—an interesting mix. Which side are you on? We may experience intense polarization. The trickster is afoot and no one is safe from self-discovery. The week also kicks off with an opposition between the Sun in Gemini and Saturn in Sagittarius (mutable fire). This increases the sense of serious consequences to thought and action. Ease. Mutable signs are busy signs. Although Gemini is perhaps one of the most lighthearted signs out there, this air sign can still get stressed out by having too many choices and too many different directions to go. Relax. Flow. Mercury retrograde periods encourage flexibility. Flow can happen when we don’t get bogged down in the details. When plans go awry, communications collapse, or we have to deal with technological glitches, use the Gemini ability to rise above those setbacks to get the big picture. Fun. One criticism Geminis hear a lot is that they don’t take life seriously. What is the problem with that? In this season of pollination, we are guided by what sparkles. Curiosity is elevated to a spiritual power. If we aren’t having more fun, then we aren’t doing our job in this lunar cycle. Monday, May 18. How much fun is it that Mercury in Gemini (mutable air) stations retrograde on the day that the Moon enters Gemini too? The fun doesn’t stop there either. The Moon also contacts the other significant mutable planets today, creating a perfect storm of fluctuating perceptions. Here is our opportunity to observe what mutable signs are all about. The Moon first opposes Saturn in Sagittarius (mutable fire). The struggle is between diversity and singularities. Getting it right is important. On the world scene we see the differences in beliefs and wonder how to find common truths. Things get jumpy when the Moon conjoins Mars midday. Mistakes can happen when we are too triggered to think things through calmly. Later, the Moon squares Neptune in Pisces (mutable water). We may all be running as fast as we can to our neighborhood bars, fantasy movies, or other activities that take us away from the stress. Throughout the day, notice the connections you feel to others and the impossibility of understanding it all. Try to rest in life’s complexity rather than attempting to control it. Tuesday, May 19. The days surrounding Mercury’s stations (retrograde or direct) are usually the most intense days of the retrograde cycle. Yesterday, Mercury stationed at 13 degrees Gemini. Early today (CDT), the Moon conjoins Mercury providing an extra jolt to the planet of electricity. It isn’t terrible that Mercury is retrograde. The best parts could be a release from drab, ordinary reality. We get to try on the roles of Magician, Alchemist, and Trickster. Cultivate curiosity and breaking patterns. In the introduction to the week, I wrote about my friend’s manta: Ease, Flow, Fun. Try that on whenever you get annoyed. 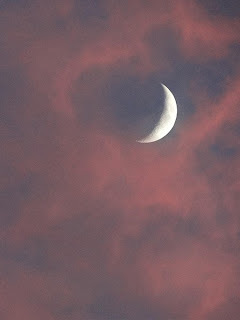 The Moon engages the help of Uranus in Aries (cardinal fire) and Jupiter in Leo (fixed fire). These two planets are egging us on to try a new approach, to be creative, to spread the joy. Wednesday, May 13. Time to reset the systems. Gemini shenanigans of the last two days set the tone for the week and this new lunar cycle that began on May 17. Now the Moon settles into Cancer for a day of restoration. Have your feathers been ruffled by disruptions and confusion (Mercury’s gift)? Then perhaps this day of no exact aspects is a good opportunity to smooth over those experiences. Work around the home if you can. Stay in tonight with a home-cooked meal. This will be the most restful day of the week. May 21—Crescent Moon: Beginning. This phase of the Moon pushes us out into the world. A few days ago at the New Moon, we had the opportunity to plant an intention into the soil of this evolving year. Now, we test that plan. Is it working for you? What needs adjusting in order to make your intentions thrive even better? This lunar cycle is influenced by the exchange between Taurus and Gemini. Taurus is the season of developing thriving rootedness. Gemini is the season of fertilizing that potential. It’s natural for some of the solid focus of the Taurus season to diffuse in the season of Gemini. However, we might lose ground if we don’t keep at least one foot grounded in the plans made last month. Mutable signs, like Gemini, are about learning, adaptation, and integration. To hone these skills we develop the tools of discernment. Observation is important. As an air sign, Gemini’s primarily observes and uses the mind to know how to respond to the needs of the moment. Mind is slippery, what are you noticing about yours? The Sun enters Gemini today. The season of pollination really gets underway. The intention I am working with this month is to reconsider my certainties. How am I stuck? What in my life needs to be pollinated with fresh ideas? Gemini is a lighthearted sign. The rest of today’s aspects are not. Notice the pull between escapism and brooding over problems. Somewhere in between, the Gemini Sun offers a new approach. Pluto can often cast a dark shadow over things. Sometimes this is welcomed. Today, Venus in Cancer (cardinal water) opposes Pluto in Capricorn (cardinal earth); Jupiter in Leo (fixed fire) is quincunx Pluto as well. The Moon in Cancer may add to the gloom. We don’t always have to be sunny. Our emotions help us move out old patterns. Friday, May 22. This is an excellent day to contemplate long-term plans for learning, travel, or exploration of any kind. Saturn in Sagittarius (mutable fire) asks us to get serious about what we know and how we use that knowledge. The Sun in Gemini (mutable air) opposes Saturn today giving us perspective on these topics. What information are you missing? The Moon in Leo (fixed fire) encourages the possibility that these plans will be creative and life affirming. And in case you forgot, be flexible. Mercury is still retrograde and all plans made now may need to be adjusted later. That’s OK.
Saturday, May 23. This has all the markings of a lovely day. May it be so! The Moon in playful Leo (fixed fire) makes fun connections with Mars in Gemini (mutable air) first thing this morning (CDT). It feels good to chat with friends, learn something new, or take our creative projects to a new level. We don’t necessarily have a lot of focusing power, but what we do pay attention to is fascinating. Later, the Moon makes a relieving aspect to retrograde Mercury. Even our technical problems can be a source of insight. As the Moon conjoins Jupiter tonight, enjoy the sparkly fun of people watching. We are fascinating, aren’t we? Sunday, May 24. Either we have a lot of energy or we don’t want to do anything today. The Moon in Leo (fixed fire) is unobstructed by any other aspects today, except for a daring tease from Uranus to try something new or break annoying rules. Leo is life force, it is childlike joy, it is noble action. How will you spend your free-spirited Leo day? I love your forecasts because they are cross-pollinates — between philosophy and astrology, psychology, astrophysics and poetry. I read these as astrological sermons and prayers - suggestions on what it means to lead a good life — intellectually, creatively, and spiritually.